FLORENCE. — Gabbi & Co. The hurricane hit and she was relentless. The slow-moving storm brought wicked wind and rain that seemed like it would never let up. The power went out and the flooding began. Trees snapped and uprooted all over. Lakes formed where water never was before. Roads collapsed and washed out. The storm left so many “without” and totally devastated. Thank the Good Lord, we made it through safely. Once the storm cleared, the clean up began. We headed outside and did our best to clean up my parent’s property as we waited for the power to return and to get word that there was a clear and safe route up to Wilmington. Unfortunately, due to wide-spread flooding, collapsed trees and washed out roads, it was inaccessible. The port city had essentially become an island. After several days of waiting for rivers to crest from inland flooding, our patience had run out. Even though the “incident map” looked like it did below, we hopped in the car in hopes we could check out our neighborhood and home. The drive up broke our hearts. It was terribly sad to see so much devastation. By the grace of God, we were one of the lucky ones. There was only minimal damage to the interior of our home from wind-driven rain and a broken vent pipe on the roof. We knew the water and dirt stains and swollen trim could be remedied during our renovation. And to hopefully guard against any future leaks, my dad and hubby took to sealing up any gaps they could find on our exterior. Our yard took the brunt of the storm. We had 5 large trees come down in our yard, and of the 4 left standing, two were leaning pretty badly. 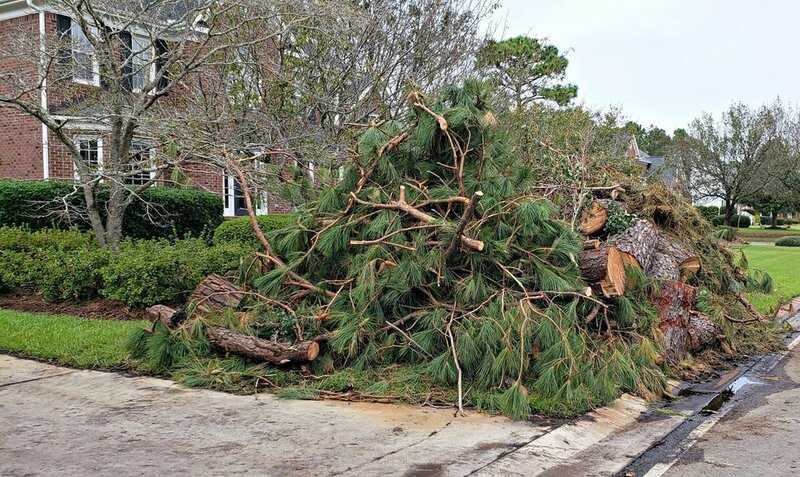 Before we even saw our home in person, we contacted a tree company to come in and begin the work to clear the trees that were down on our property. We knew the demand for them would be incredibly high and we we didn’t want to risk waiting to call until we could make the trip and see our yard for ourselves. When we arrived, we saw just how much damage our yard sustained from, not only the water pooling and the trees falling, but from the tree company doing their work on our over-saturated grass. Since our property was already an absolute mess, we decided it’d be best to drop not only the two leaning trees, but the remaining two that would have been left standing. It broke my heart to lose more trees, and more privacy that we were already sorely lacking on our property, but I knew I could never forgive myself if we didn’t take the trees down now with the potential for them to go down in another storm and possibly land on someone else’s yard or home. It’s just not a risk we would ever want to take. So in one storm, our landscaping totally changed.